Injectable calcium-alginate hydrogel (Algisyl) implants worked better than standard medical therapy for patients with moderate to severe heart failure, researchers said today at the American Heart Association 2015 Scientific Sessions in Orlando, FL. In a surgical procedure, the substance is implanted into specific areas of the failing heart muscle. It is classified as a medical device and is made by LoneStar Heart, Inc. of Laguna, CA. The device is already approved for use in Europe. Douglas Mann, MD, of the Washington University School of Medicine in St. Louis, MO, and colleges at other institutions reported on the trial known as AUGMENT-HF. The international, multi-center trial studied 58 patients with heart failure. Treatment with the drug improved heart function and patients' ability to exercise. Its use was associated with statistically significant improvements vs. controls for VO2 at anaerobic threshold, peak watts, total exercise time, distance, NYHA functional class and Kansas City Cardiomyopathy questionnaire scores. "Prior clinical results for Algisyl demonstrated both safety and potentially important clinical benefits for patients with advanced heart failure refractory to standard medical therapy," they wrote in an abstract presented at the meeting. "These results demonstrate that Algisyl in addition to standard medical therapy was more effective that standard medical therapy alone," they noted. According to the manufacturer of the algisyl system, the clinical trial analysis was not statistically powered to assess mortality or morbidity. At the 12-month follow-up, there were 13 deaths including 4 in the control group and 9 in the treatment group. The overall incidence of serious adverse events was not significantly different between the Algisyl and the control group. However, Algisyl patients experienced substantially lower rates of worsening heart failure (34.2% of control patients vs. 15.0% of Algisyl patients) and sustained ventricular arrhythmias (13.2% of control patients vs. 2.5% of Algisyl patients). 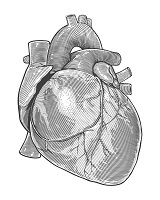 "Algisyl is a novel tissue-engineered product developed to stop and reverse the damaging effects of ventricle enlargement providing an alternative to current treatment," the company said in a news release. "Algisyl is a highly bio­compatible, inert hydrogel sourced from brown marine algae that is injected into the enlarged left ventricle muscle where it remains as a permanent scaffold." Further, the company said, "Algisyl thickens the wall and reshapes the heart to reduce muscle tension and improve pumping efficiency." The trial outcome indicates this mechanism leads to an improvement in exercise capacity and clinical symptoms, the researchers said.